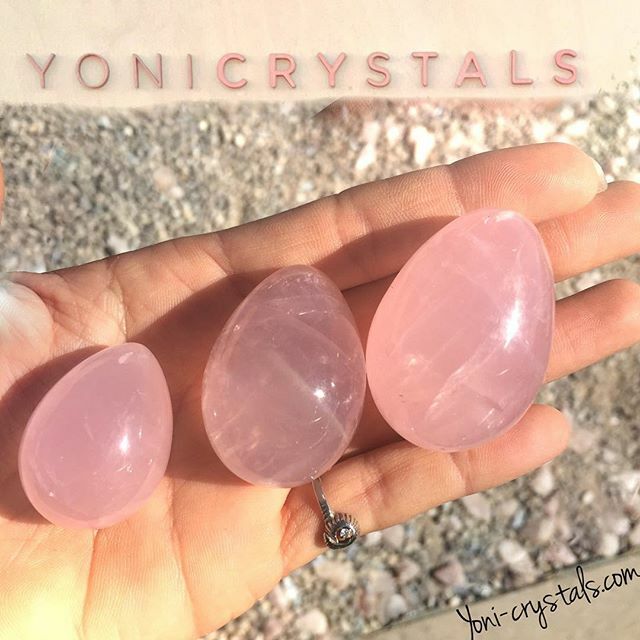 Our yoni eggs come in three sizes, small, medium and large. According to traditional Taoist practice a woman would begin with the large size and ‘work her way down’ to the small. Because the small can be more difficult to feel/notice cause it’s smaller. Yoni Crystals feels that, perhaps, a woman’s intuition may know what's best for her body. If a woman is called to a small yoni egg crystal, we say listen to that. Or if a woman is called to a large yoni egg, go with that. If your unsure where to begin, a medium is a good starting place. If a woman’s given birth vaginally then the large yoni egg may be the best for her. We encourage women to listen to their own intuition when exploring this intimate crystal practice. Thread the yoni crystal by using 2 feet of unwaxed, unflavored dental floss. We offer a drilled and undrilled style. Drilled eggs make for easy removal (and peace of mind) by threading the egg with unwaxed, unflavored dental floss, see diagram. Threading the egg is also for practicing 'retention training.' This is done by gently pulling on the floss while retaining the yoni egg inside to feel the strength and resistance of the yoni holding the egg inside. If working with a drilled egg, be certain to clean inside of the drilled hole before and after each use.